We have come so far with cancer research in the last decade, especially in the area of early detection. One of the most accurate tests for early detection is Telomere testing. 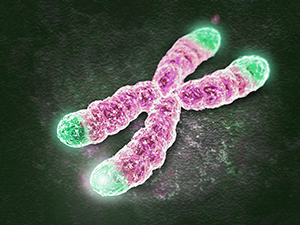 Telomeres are an essential part of human cells that affect how our cells age. Telomeres are the caps at the end of each strand of DNA that protect our chromosomes, like the plastic tips at the end of shoelaces. At conception, you have 15K of them, at birth, you have 10K and by age 50, you are down to as low as 5000 telomeres. These protective caps are what keeps your DNA intact and stops it from mutating into cancerous cells. A simple blood test gives us an analysis on your telomere count to determine your risk for cancer. As always, the things we can do on a daily basis to prevent cancer are not smoke, eat healthy and exercise. Remember, genetics may load the gun, but environment pulls the trigger! Telomere testing and supplementation using TA-65 to rebuild your aging cells is available at The Alpha Male Medical Institute. Call Dr. Rob today at 937-350-5527 to schedule your testing and begin the path to restoring your vitality!